Should we add a [rules-as-written] tag warning, and what should it say? 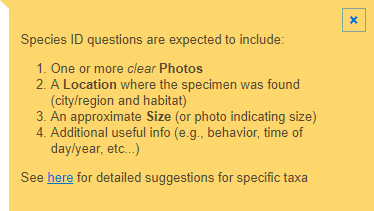 This example comes from Biology SE’s [species-identification] tag. You can try it out yourself here — click into the tag field then back out to see it show up. This is a table of questions created during the past 16 months and the 16-month period before that which are connected to the RAW tag in one of three ways. 16 months ago is the time period since the “back to tagging basics” proposal† was suggested and endorsed and changed the way we handle the RAW tag, so these time periods were chosen to compare before/after that meta. Total of questions in row 1+2+3 for that column. All percentages in a column are a percentage of this total. You may notice what I notice in these stats: before 16 months ago, questions almost always kept the tag. Since the "back to basics" meta† we've seen a dramatic change: in the past 16 months, 52.2% of these questions arrive with the tag and then have it removed — more often than the question gets the tag added or kept in total. Out of the 421 usages of the tag by the OP (sum of tag removed + tag kept), 55.8% usages result in it getting removed. On average a question that gets the tag removed arrives every 2-3 days. I’m hoping that adding a tag warning would reduce these cases of it needing to be removed, and would reduce the maintenance effort involved in this tag. † "Back to basics" changed the way we handle the RAW tag: we nowadays handle it like any other non-system tag, which means we require questions to make it clear in the body why a tag is present, and if it isn’t clear, we seek clarity from the author and either clarify the post or remove the tag. Prior to that meta (before 16 months ago) the RAW tag was handled differently and it we didn’t have a good way to clarify whether the tag should be on a question or not. Are investigating as a priority literal interpretations of the rules, even if it leads to absurd situations. Are not usefully answered solely by homebrew, house rules, or speculation of intent. Please express what you're looking for in terms of these criteria in your question body. If you're just asking about the rules of a game without these additional expectations, you don't need this tag. A Rules-as-written question does not simply ask about the rules of a game. It implies finding out the most literal (even if improbable) reading of what has been written in the game aids. By adding this tag, you're asking the answer to avoid speculation about authoral intent taking precedence over what the text actually says. It is often important to people to know what the rules say before deciding which houserules to apply. Or something like that. I'm not too good at this, and even finding a definition of what RAW is that is good for everyyone is hard. Workshopping accepted! What is actually [rules-as-written]? We should find out! Some time ago, being very new to the site, I tried to understand the nature of the rules-as-written tag. I did make a mistake (?) of marking my question about game rules with rules-as-written tag, and I did make a mistake of basing my answer for a rules-as-written question on a house rule, because nothing in the question body was implying that the answer is expected to be made in a very special way. So it was definitely a good idea to ban describing what kind of answers you can provide using a tag. However, my quest of googling for what rules-as-written is actually failed. I found too many more or less different definitions. I think, before adding the tag warning, a single definition has to be chosen. According to dandwiki.com, RAW is "Rules as written in the D&D game refers to the rules that WoTC publishes. In a wider sense it means the rules of the game being played. Rules as written is used to distinguish these from both house rules and what may have been intended that the rules were to be, such as a reference in a blurb to an ability that the class in question does not actually get or that is being used incorrectly. It is important to note that often the rules as written are open to interpretation as there may be multiple viewpoints on what the RAW is." In short, "RAW is "official (not house) rules, but there may be more definitions". According to the only definition in the Urban Dictionary, "Rules As Written. Used by players of D&D and other RPGs to indicate a literal interpretation of the rules, often to gain some unintended, overpowering game effect." According to the tag wiki, in short, RAW is not a sign "no house rules, please", neither is it for clarification of the rules. According to this article on implausiblenature.net, RAW is considered the opposite of RAI (Rules-as-intended). RAW basically says "if the rules don't allow it exactly this way, you can't do it this way", RAI says "if the rules are shady on that part, but you clearly see the intent behind, do as you think it was intended". Notice that the article is written for a war game, Warhammer 40k, not a role-playing game, but the problem still persists: even in a war game you cannot describe all of the possible situations, and sometimes there are still non-trivial spots in the rules. According to this article written in German language, if I didn't botch my Linguistics check, RAW means simply "read rules exactly as they are written, word by word", notifying that it may lead to some very absurd situations. Also, "Rules As Written is a podcast by four friends who discuss their interpretation of the rules in D&D and tabletop and how certain combinations of the rulesets can create for unusual and likely unintended consequences. While many of these discoveries fall out of game play organically during Tony's or Bethany's games as DM, conversation also includes attempts to find odd combinations that spark intrigue and laughs at trying to find the most unusual circumstances." I couldn't listen to it, though, as the server doesn't allow to download. That's all that I found on the first page of Google search results. RAW meaning "read rules exactly as they are written, do not add anything, read as literal as you can, even if it leads to absurd situations. RAW meaning "do not use/refer to house rules". The two definitions seem to be both relatively common, and perhaps we should stick to one of them, writing a tag warning saying which one do we use here. Who, it must be pointed out, have an avowed “hatred” of the very concept. Their word. Ignores community consensus disagreeing with that definition. Is enforced silently and unilaterally by those same two users; comments are not used to try to educate users, or even to determine if it is appropriate to do so. Quite frankly, the definition of rules-as-written as it is enforced here is wrong. The net effect is to marginalize and minimize the usage and placement of the tag on this site. Any warning would have to either include this special definition—which I adamantly oppose—or else would have to fix these issues before the warning is written. These issues are not with the community’s consensus, they are not with what has been discussed on meta, they lie solely in how the tag has been moderated above and beyond what was agreed upon. The KISS principle needs to apply. If the tag wiki and tag description do not sufficiently embody what the tag means, then update them, or upgrade them, so that they explain the tag better, more clearly, or more concisely. That offer was made sometime back, but whatever upgrade did (or didn't) get written obviously needs more effort or improvement. Adding a warning to this tag strikes me as a case of picking at a scab. Using a warning makes it look to me that you are discriminating (perhaps unintentionally, and with the best of intentions) against this tag and its users. The road to hell is paved with good intentions. Fix the tag wiki, and the tag descriptions. Let the informed user know what the tag is used for. The uninformed user won't care either way, and you can't fix that. Here's an example where two informed users can't seem to agree on how we use RAW tag here on the site, but neither user is the question asker. Not the answer you're looking for? Browse other questions tagged discussion tag-warnings rules-as-written . Time to retire the [rules-as-written] tag? What, exactly, is the RAW tag for? Why do we ask for the body of the question to demonstrate the tags it uses? Does using the Rules as Written tag restrict answers to only using RAW? Is theoretical charop on-topic or off-topic?